This Fords Colony wedding was the perfect fall day for a wedding! The air was crisp but not too chilly and the skies were clear. Fords Colony is such a pretty venue and with beautiful fall trees lining the golf course it was absolutely gorgeous! As Virginia wedding photographers we will never get enough of the beauty this season brings each year! 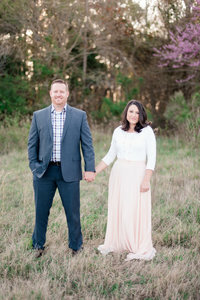 Paul & Staci got ready at the Marriot Manor in Williamsburg that is located in Fords Colony. If you have a wedding at the golf club then you definitely need to book a room at this Marriot. It is so pretty and such a great place to have pictures done. We were able to their first look right against an ivy covered wall and I loved the different unique locations we could go for portraits. It was also right outside their room so if they forgot anything they could run back in! These two decided to write letters to one another. They also decided to read them next to each other. It was such a sweet moment between the two and I am so glad we got to capture it. Speaking of these letters, Staci your cards will go in the mail tomorrow! It always happens that I get asked to hold on to things and for our couples and I somehow manage to go home with it! I am trying to work on memory! One of my favorite things about Ford’s Colony is their ceremony site. The room is lit up by window light and in front is a beautiful fireplace. I love how Courtney from Courtney Inghram Events lined the mantle with gorgeous florals! Even the chairs got some love and it was so pretty. Because of the weather these two were able to utilize the fireplace and it only added to the aesthetic of the celebration. I loved the dances that they both did with their parents. Staci’s dance with her dad had everyone cheering and laughing and when Paul danced with his mom eyes watered all around. Parent/child dances get me every time! Thank-You Paul & Staci for having us join you for your wedding celebration! We absolutely loved getting to know you both and we wish you two a lifetime of love and happiness! These photos are great for fall wedding ideas! More amazing weddings visit the links below!